with W. W. Sampson and Sons. Anonymous sale; Christie's, 6 May 1921, lot 111 (25 guineas to Mitchell). 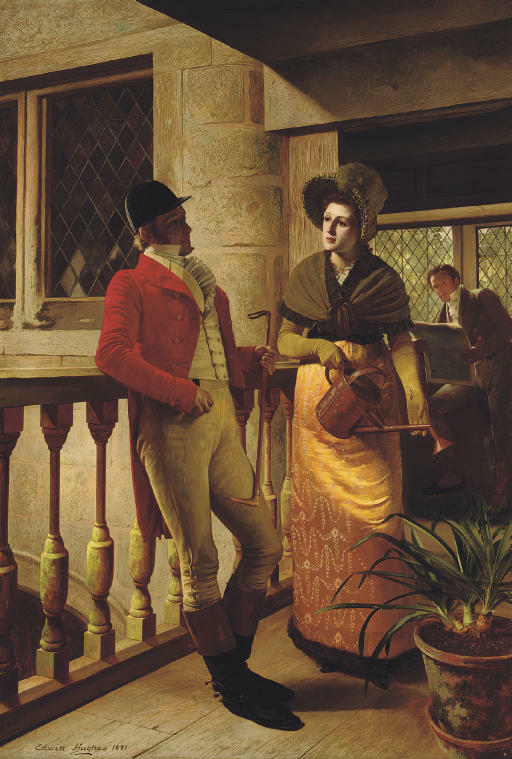 Hughes enjoyed depicting rivals in courtship, and painted the subject, in different guises, several times. Here the two swains are contrasting character types. One, dressed for the hunt, embodies the active life: his rival, reading indoors, embodies the contemplative. They are competing for the hand of a girl not in her first youth: she is watering a pot of nerines, late-flowering autumn plants. Her dress is typical of that satirised by Gilbert and Sullivan in their comic opera, Patience, of 1881, being 'greenery yallery, Grosvenor Gallery'. Perhaps Hughes, and his audience, might have drawn further parallels with the libretto.